This will go to the top of the weekend's listening. Thank you so much. Sounds like it could be interesting. Thanks, Edmond! Wat is dat nou? 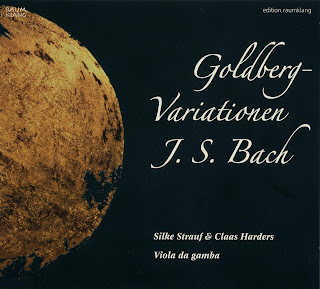 De Goldbergvariaties met viola da gamba? Dat is nieuw voor me. Interessant. Dank je wel. What is that? 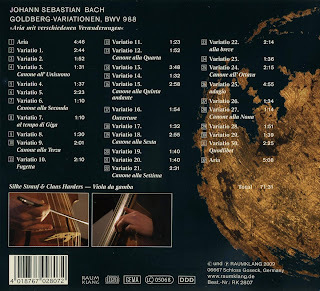 The Goldberg Variations With a Viola da Gamba. Interesting. Many thanks. is it possible to have on mp3 ? Thanks for all your appreciating comments! It may not be the ultimate alternative Goldberg-recording, but I found it too curious as not to share it with you. @Ricardo: Alas, this site is lossless only. I don't know the first thing about mp3's I'm afraid. Quite unusual for the Goldberg Variations, interesting. Merci mille fois. Quelle magnifique initiative. Je l'ai téléchargé, maintenant je vais acheter plusieurs copies du disque pour les offrir. Thanks so much. Beautiful project. I've downloaded it and now I ma going to purchase copies of the CD for gifts.